Please click on the links below to download our holiday dates. The minimum attendance level which is expected for all primary aged children nationally is 95%. Further to this, individual schools are required to set an annual target for attendance. 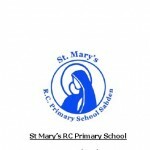 St Mary’s target for this year is 97%. In order for us to meet this target we need to ask that all pupils aim for this level of attendance. A good attendance record is vital because even short periods of absence can mean that a child’s ability to keep up with school work may be significantly reduced. Friendship groups can also be affected by time away from school and this can be very upsetting for children. In order to assess our progress in meeting this challenging target we review the attendance of individual pupils at least once every half term and contact parents of children who are not meeting the target to find out if they need any help or support. Family holidays should not be taken during term time. The Head is not able to authorise these and your child will be marked as taking unauthorised leave. The Head is able to authorise leave for exceptional circumstances such as funerals and a form needs to be completed to request this authorisation. The form is available from the office or by clicking here and it should be completed and returned to the office. The happiness and educational progress of all the children at St Mary’s are our priorities and we believe that good attendance is a major way in which these priorities can be achieved. It is for this reason that we ask for your support in this matter. If you would like any further advice in relation to attendance please do not hesitate to contact school.